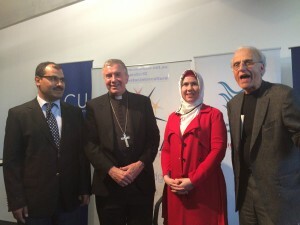 Fettulah Erdogan (director of Blustar Islamic Intercultural Centre), Archbishop Christopher, Zuleyha Keskin and Professor John Esposito. The Archbishop joined Georgetown University’s Professor John Esposito and Islamic academic Zuleyha Keskin for the December 3 lecture, which was titled, ‘Uniting or dividing? Christians and Muslims in our globalised world’. “The night was well attended and broader perspectives on how we can act locally, but at the same time, think internationally in these troubled days with the radicalisation of religions, was a common feature,” he said. The event was organised by Bluestar Intercultural Centre, and was sponsored by the ACCC, Australian Catholic University, and the Archdiocese. “I was delighted that a national Muslim group… asked if we could co-host the event,” the Archbishop said.